If you're considering air conditioner replacement, Air Doctor Inc. is a Las Vegas Air Conditioning Contractor that guarantees the best prices on any new cooling system. What's more, we take the time to do new A/C installations right the first time around! Is It Time For an Air Conditioner Replacement for your Las Vegas home? Are you caught in an ongoing cycle of a/c repair work? Is your air conditioner not working like it should? Are your power bills getting higher every month? Do you want an energy-efficient unit that can cut your power bills in half? Is your a/c system nearly 15 years old? Is your home overly dusty? Do you want to increase your property value? If you answered yes to any of these questions, it may be time to upgrade your air conditioning system, especially one that's getting on in age. Cooling systems generally die after about 15 years and the energy ratings of old units cannot compare with those of systems sold today. Visit our High Power Bill webpage to learn how an old a/c system can cost more to run than to replace! In a desert climate like Las Vegas, 85 percent of your power bill reflects cooling costs. Energy-efficient cooling systems use 30-70 percent less power, cutting your energy bills by up to 50 percent! Another factor is size. Studies indicate that up to half of all residential cooling systems are either too small or too big. They may also be improperly charged, containing too little or too much freon. Too-large cooling systems consume more energy and cost more to run than properly sized units. Replacing a too-large unit can save you some serious money. In warm climes like Las Vegas, energy-efficient system replacement can increase property value by what's called "cost plus ten." Property value rises by the cost of the cooling system, plus 10 percent. Affordable cooling costs make properties more attractive to potential renters and buyers. Energy-efficient air conditioning units like a 20 SEER system deliver fresh, clean air. They greatly reduce the presence of dust, airborne particles and other unhealthy contaminants in your home. We have a huge variety of cooling systems from all the top manufacturers. The experienced Air Doctor team can determine exactly the system size and cooling capacity needed to provide maximum comfort and peak performance. What's more, Air Doctor sells quality products at a discounted price! The air conditioner replacement process is fast and efficient with no mess and minimal disruption. Our installation crew has the technological expertise to install any system properly, even when it's located on the roof. 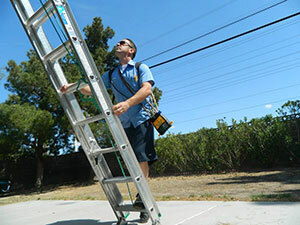 Our on-site installation manager will ensure that all work is 5-star quality. When we install a new unit, we take the time to calibrate the superheat and sub-cooling functions to achieve an exact charge and prolong the life of your unit. Other companies may just load the system with refrigerant to make it blow cold, but not us. We want you to be happy with your new system, so we protect your investment with careful and correct installation. Not all Las Vegas air conditioning contractors perform rooftop a/c replacement. At Air Doctor, rooftop cooling systems are our specialty! Our experienced rooftop installation team does all the "heavy lifting" necessary to successfully install a high-functioning commercial rooftop cooling unit. 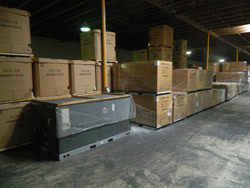 Commercial rooftop cooling systems are sized in tons. Sizing refers not to the weight of the system, but rather to the system's cooling capacity. 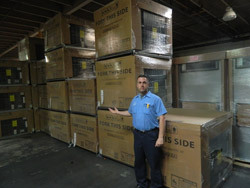 Our pricing discounts have been as low as $4,000 for a five-ton a/c rooftop installation! Call Air Doctor at (702) 243-4000 for a no-cost estimate on a specially-priced rooftop a/c replacement. We are an air conditioning contractor in Las Vegas that promises to beat any written estimate from our competitors. With Air Doctor, you just can't lose! We provide professional, ethical consultations, written estimates and new a/c installations for home builders and individuals. It's essential to consult with an expert to ensure that your new construction is equipped with an energy-efficient system that delivers clean and comfortable air year-round. Our work comes with a 100 percent satisfaction guarantee. We believe in our technicians and we know that you will too! We work with trusted air conditioning manufacturers like Trane, Goodman, York, Lennox, Rheem and Ruud who guarantee their ground level and rooftop air conditioning systems with a ten-year limited parts warranty. Air Doctor Inc. is a Las Vegas air conditioning contractor that offers discounted pricing on top-notch products. Call (702) 243-4000 for a free written estimate on a new residential or commercial cooling system and learn how affordable a/c replacement can be! Looking to have your a/c unit repaired or even your heating system? We're also a Las Vegas air conditioning repair service and a Las Vegas furnace repair service.